Gambler’s Classic winner and 2014-2015 LSMP Indoor Auto Racing champion Erick Rudolph headlines the newest installment of Speed77 Radio’s Motorsports Madness, tonight beginning at 7 p.m. Eastern on the Performance Motorsports Network. 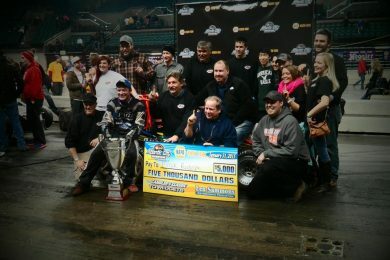 Co-hosts Jacob Seelman and Tom Baker will talk with Rudolph about his stunning indoor season that included wins in Trenton, N.J.; Fort Wayne, Ind. ; and Saturday’s triumph in Atlantic City, N.J. The dynamic duo will also lead the Race Chaser Online crew through an assortment of motorsports news and rumors including nuggets from last week’s Charlotte Motor Speedway Media Tour presented by Technocom, Ryan Dungey’s first Supercross win of the season in Anaheim and more. Joel Sebastianelli returns to the Roundtable to talk IndyCar and Formula One news, and Steven Ovens also slides in to bring the latest dirt track racing news to the forefront as well. As always, commentary on all things motorsports is also possible during the fastest motorsports show on the web — including dirt and pavement modifieds, super late models, NASCAR and much more! Download the TuneIn App or the Aha Radio App from your phone’s App store (both are free and Performance Motorsports Network is on both apps)! Visit Performance Motorsports Network’s website at www.PerformanceMotorsportsNetwork.com and hit the “listen live” button in the upper right! Visit www.RaceChaserOnline.com’s Live Radio page and hit the “listen live” link! The show will also be rebroadcast on the Performance Motorsports Network on Wednesdays from 8-10 AM Eastern and Friday from 6-8 AM Eastern time and uploaded on-demand to the RaceChaser Online YouTube Channel on Thursdays for fans who are not able to listen live. Speed77 Radio is RaceChaser Online’s broadcast division and together they produce Motorsports Madness on Monday nights at 7 PM Eastern and the Stock Car Steel / SRI Motorsports Show on Thursday nights at 7 PM Eastern on the Performance Motorsports Network. Turn 5 Live is a New York-based weekly dirt-track affiliate of RaceChaser Online and Speed77 Radio, airing live on Tuesday nights at 7:30 PM Eastern on the Performance Motorsports Network.